Wattuya’s exhibition will be accompanied by catalogue materials with an essay by Paul D’Agostino. You can read the essay below. Before you are so many faces you’ve seen so many times before. You recognize some of them. You might recognize most of them. It’s unlikely for you to recognize all of them, for some of them have facial features that have shape-shifted in certain ways that leave them partly morphed — if not gradually, strangely ever-morphing — into arguably more monstrous, more horrid, more day-glow lurid, or simply weirder versions of themselves via physiognomic hybridizations with the visages of others of kindredly villainous ilk. They are a rogues gallery of proverbial good, bad and ugly, albeit by and large lacking any and all good. This somewhat humorous, somewhat serious, somewhat shocking, altogether creepily ominous merging of murkily meta-facial imaginings is what came about when Thai artist Tawan Wattuya brought into conceptual confluence two of his most enduring interests and sources of inspirational inputs in a search for subjects for his solo exhibition at The Lodge Gallery, the artist’s first solo show in the United States following many others in Thailand and elsewhere. So then, his interests and inputs? The monsters and weirdos of primarily classical cinema, and the monsters and weirdos of contemporary politics. In this semantic context, only for the latter group, the politicians — most especially those who have most atrociously invaded our minds and newsfeeds in 2017 — does the expression ‘monsters and weirdos’ rank as understatement, if not indeed a generously kind one. In contrast, in this bizarre visual and thematic context, the ‘monsters and weirdos’ of cinema — here facing off against the more consequentially despicable characters with political mandates — begin to seem awkwardly friendly, maybe even lovable. Considered collectively, however, Wattuya’s rogues begin to seem endlessly, newsworthily questionable. For example, who appears more ‘dracular’ here, a draconian despot like Bashar al-Assad or Dracula himself? Who better embodies sliminess and living death, a blood-sloppily reptilian zombie or Robert Mugabe? Who seems more childishly, lethally maniacal, ‘playful’ little Chucky or ‘Rody’ Duterte? Who might be better at encouraging local populations or entire geographical regions to hide in fear or flee: King Kong, Frankenstein’s Monster, Freddy Krueger or Aung San Suu Kyi? As you continue to look around and pose yourself such questions, you begin to realize that the politico-cinematic monsters whose likenesses are most fully converged are the ones who seem most hellishly denatured, repulsively demonic, devilishly absurd. And of course, once you’ve fully examined this lineup of rogues so totally bereft of do-gooders, you will have recognized quite immediately, and many times over, the face and coiffure of a certain world leader who has spewed Godzilla-tons of fire this year. And you’ll recall that we’re all in hell. Or, to be a bit less alarmist, we’re at least pretty close. And by that I mean that in this chaotic meantime we all share and perhaps collectively abhor, we might at least find an aesthetically pleasing sense of darkened joy in Wattuya’s wonderfully imagined, crazily populated, jubilantly colorful, comically hellbent limbo. Tawan Wattuya was born in 1973 in Bangkok, Thailand, where he currently lives and works. 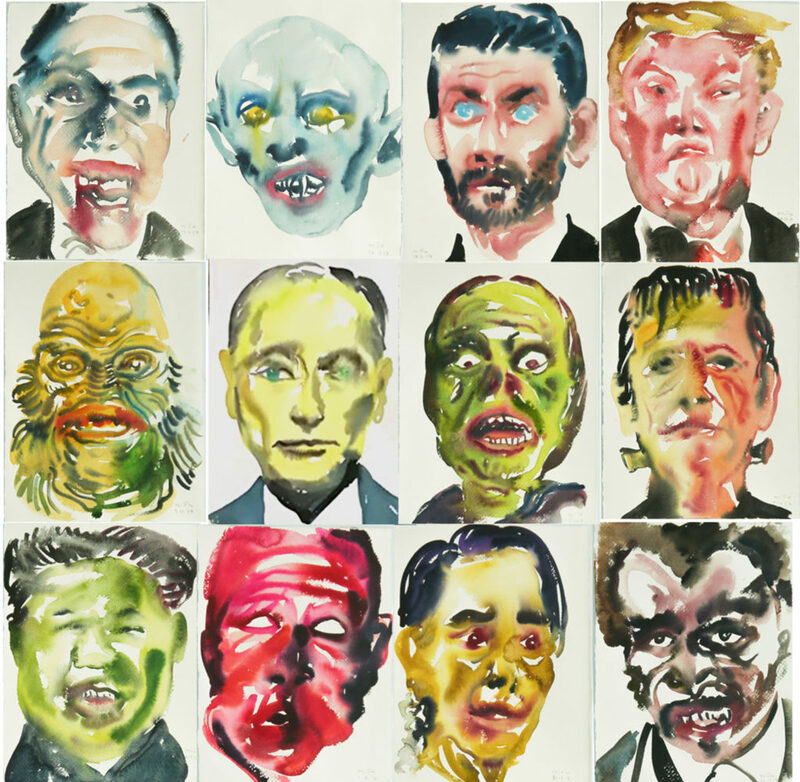 He is known primarily for his vibrantly colorful and expressive paintings in watercolor and ink, and for choosing often politically relevant, sometimes controversial subject matter. His international exhibition record of solo shows, group shows and art fairs is extensive, and his paintings are held in many collections. He was one of the artists in a two-person show at The Lodge Gallery in 2016, and he has had work in recent exhibitions at Sundaram Tagore, in New York City, and at Saatchi Gallery, in London. In Thailand, Wattuya has exhibited at Toot Yung Art Center, The Art Center of Chulalongkorn University, Bangkok Art & Cultural Center (BACC), HOF Art Gallery, WTF Gallery, Tang Contemporary Art, Gallery D-9, Ratchadamnoen Contemporary Art Center, and Numthong Gallery. He has also shown in a number of galleries in Japan, Singapore, Taiwan, Australia and France.